You have direct access to the beach and the boardwalk is just steps away. Rain or shine, the indoor pool has your back. Spacious condos let you really feel at home. The fitness center has what you need to meet your workout goal. 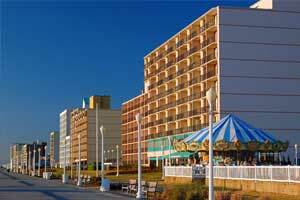 Located right on beautiful Virginia Beach. The Virginia Beach Surf & Rescue Museum is a 12 minute walk from the resort. Humor the little ones with a stop at the indoor pool.